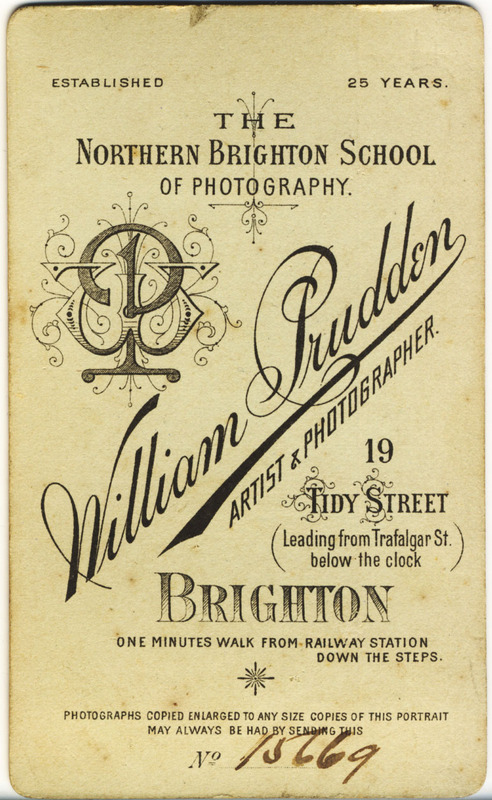 The origins of the Brighton photographer William Prudden are not absolutely clear. When the 1901 census was taken, William Prudden, then described as a "Photographer (Employer)", aged 59, gave his place of birth as Barnet, Hertfordshire. Previous census returns (1861, 1871, 1881), however, state that the Brighton photographer was born in London. Research independently carried out by Yvonne Dedman and John Yates has indicated that William Prudden the Brighton photographer was, in fact, William Prudden (1), the son of Philadelphia Prudden (born c1807, Welwyn, Hertfordshire) a domestic servant. Around the time Philadelphia (Phillis) Prudden became pregnant with her son William, she was working as a servant and living in Manchester Square, St Marylebone, London. It appears that William Prudden (1) was born in London around 1842. Yvonne Dedman believes it is possible that Philadelphia Prudden was unmarried when she gave birth to William Prudden (1). When William Prudden (1) married in 1867, he stated that his father was "Henry Prudden" who had previously been employed as a "Coachman". John Yates has established that Phillis (Philadelphia) Prudden was living at 28 Upper Park Place, Brighton, with her 9 year old son William Prudden when the census was taken on 30th March 1851. Phillis Prudden (entered as "Phillis Pruden" on the census return) is described by the enumerator as a 43 year old widow from "Wellen" (Welwyn), Hertfordshire. The place of birth of her son William Prudden (1) is given as "London". William's mother, Phillis Prudden, was serving as a nurse to the children of Esau Hawkins and his second wife, Sarah Hawkins (formerly Prudden). 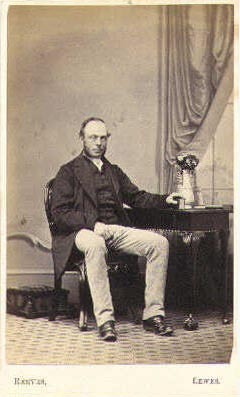 Esau Hawkins' wife was born Sarah Prudden in Barnet, Hertfordshire, around 1814, and was probably related to Phillis (Philadelphia) Prudden, William Prudden's mother. In 1829, Phillis Prudden was a witness to the marriage of John Prudden (born c1803, Barnet, Hertfordshire) which took place in St. James, Westminster. His mother's family connections to the Pruddens of Hertfordshire might have prompted William Prudden to declare that he originated from Barnet, Hertfordshire, when he completed his census returns in 1901 and 1911. The birthplace details given on the 1901 and 1911 census returns have muddied the waters, as this information pointed to a William Prudden (2), who was born in 1839, the son of John Prudden and Lucy Fairs of Chipping Barnet. John Prudden (1803-1876), the father of William Prudden (2), was born in Hertfordshire at Chipping Barnet (High Barnet), a parish and market town, roughly 10 miles north-west of London. John Prudden worked as an agricultural labourer. Lucy Prudden, John Prudden's wife, was born in 1810 at Baldock, some twenty miles north of Chipping Barnet. John Prudden and his wife Lucy produced at least seven children - James (born 1836), William (born 1839), George (born 1841), Edward (born 1844), Lucy (born 1846), Charles (born 1848) and Alice (born 1851). At the time of the 1851 census, John Prudden is recorded as a farm labourer. William Prudden (2) is entered as a scholar, aged 12, which suggests a birth date of 1839. By the time the 1881 census was taken, Mrs Lucy Prudden, now a widow and described as a former laundress, was living with her son George Prudden and his family in East Barnet, Hertfordshire. Mrs Lucy Prudden died in Barnet in 1885 at the age of 75. Both Yvonne Dedman and John Yates have pointed out that William Prudden (2), who was born at Chipping Barnet in 1839, could not possibly be the Brighton photographer, as he died at New Barnet on 28th June 1869. It appears that William Prudden(1) was living in Brighton before the census was taken on 20th March 1851. 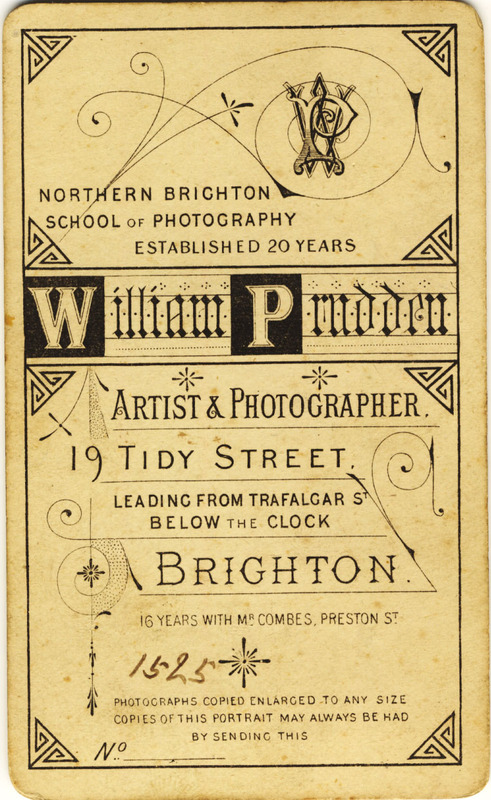 By his own account, William Prudden was working as an assistant photographer in Brighton by the mid 1850s. Philadelphia (Phillis) Prudden, William's mother, died in Brighton on 20th February 1861, at the age of 54. At the time of her death, Philadelphia (Phillis) Prudden was residing at 10 Liverpool Street, Brighton, where she was employed as a servant. When the census was taken 7 weeks later, William Prudden (1), described on the census return as an 18 year old "Photographer", was lodging at 57 Carlton Street, Brighton. In 1861, William Prudden (1) informed the census enumerator that he had been born in London around 1842. [ABOVE] In his studio publicity, William Prudden declared that he had worked "Sixteen years with Mr Combes". Charles Combes was an early photographer who had opened his first photographic studio in 1854. 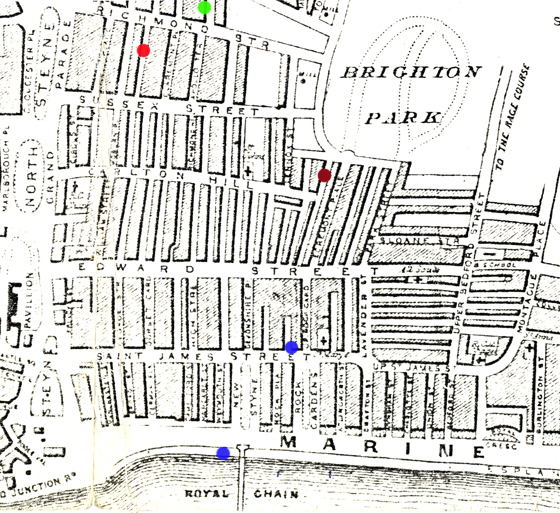 [ABOVE] A map of Brighton dating from the 1860s which shows significant locations in William Prudden's early life and career in the seaside town. 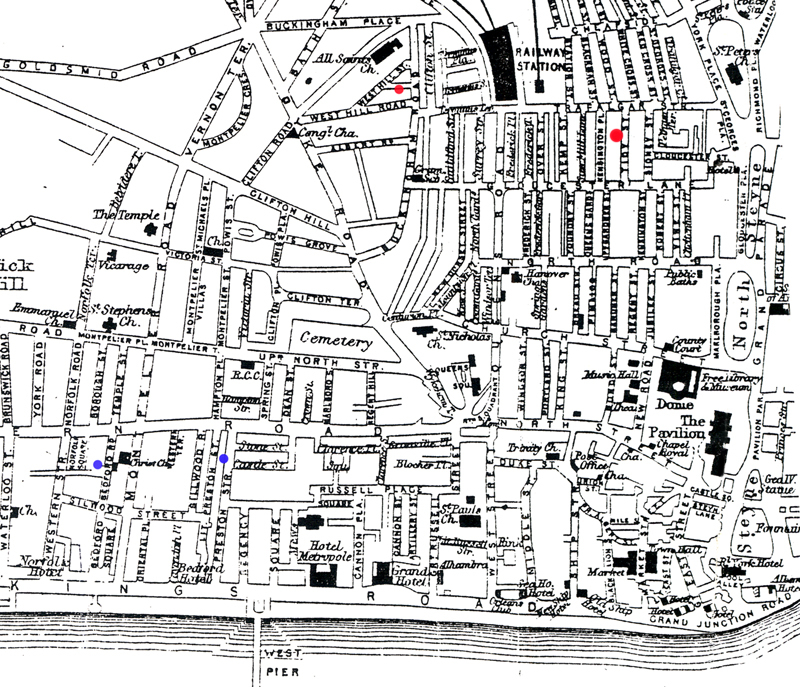 The brown dot shows the location of 28 Upper Park Place, Brighton, where William Prudden was living with his mother Philadelphia (Phillis) Prudden at the time of the 1851 census. The green dot indicates the position of Liverpool Street, Brighton, where Philadelphia (Phillis) Prudden passed away in February 1861. The red dot marks 57 Carlton Street, Brighton, where William Prudden was lodging at the time of the census in April 1861. The blue dots show the location of the photographic studios where William Prudden was employed as an assistant during the period 1854-1861. Charles and John Combes had opened a "Photographic Gallery" at 62 St James Street, Brighton, in 1854. Charles Combes set up another photographic studio on the Chain Pier Esplanade around 1858. In his later publicity, William Prudden declared that he had been "16 years with Mr Combes". William Prudden appears to have had little knowledge of, let alone contact with, his putative father. When William Prudden married in 1867 he informed the Registrar that his father was "Henry Prudden", a coachman. Yvonne Dedman has suggested that William Prudden was possibly Philadelphia Prudden's illegitimate child. Thirty years later, when he married for a second time, William Prudden stated that his father was "William Prudden, private coachman, deceased". Around 1854, William Prudden went to work for Charles and John Combes, two young brothers from Seaford, Sussex, who had recently established a "Photographic Gallery" at 62 St. James Street, Brighton. The photographic studio operated by the Combes Brothers was one of the first to offer daguerreotype portraits in Brighton after the patent on the daguerreotype process expired on 14th August 1853. Two years earlier there had only been one daguerreotype portrait studio in Brighton - the Photographic Institution at 57 Marine Parade belonging to William Constable (1783-1861). In 1841, William Constable had purchased a daguerreotype licence from Richard Beard, the British patentee of the daguerreotype process. By 1854, the number of daguerreotype studios in Brighton had increased from just one to over half a dozen. Charles Combes (1830-1872), the son of a Seaford shoemaker, had joined with his younger brother John Combes (born 1834, Seaford, Sussex) to operate a photographic portrait gallery in the Kemp Town district of Brighton. By 1856, Charles and John Combes were producing photographic portraits by three distinct processes - daguerreotype (on silvered copper), talbotype (on paper) and collodion (on glass). On 31st May 1858, the partnership between Charles Combes and John Combes was dissolved, with the younger brother keeping the studio in St James Street. Charles Combes retained ownership of a studio which he and his brother had recently established on the esplanade that led to Brighton's Chain Pier. Charles Combes set up a second studio at 19 Bedford Place, Brighton around 1862. 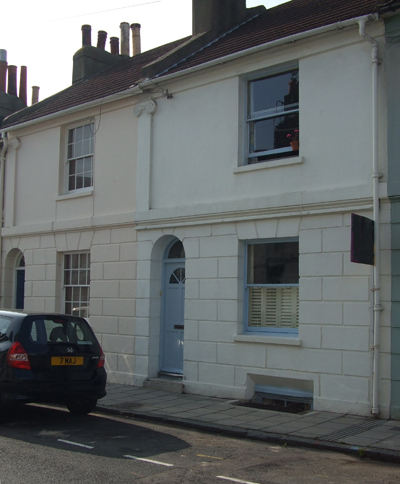 From 1865, Charles Combes concentrated his energies on a single studio at 31A / 32 Preston Street, Brighton. When the partnership between two Combes brothers ended in 1858, the teenager William Prudden was kept on as an assistant by Charles Combes. According to his later publicity, William Prudden worked as an assistant to Charles Combes at his various studios for 16 years, from around 1854 until about 1869, when he left Combes' employment to establish his own photographic portrait studio in Brighton. [ABOVE] Portrait of a seated woman, a collodion positive (ambrotype) photograph by Charles Combes of the Chain Pier, Brighton (c1860). William Prudden worked as an assistant to Charles Combes for sixteen years, from around 1854 to 1869, when he left to establish his own studio. [ABOVE] The presentation case which contained the collodion positive portrait shown on the left. The case carries, in gilt lettering, the trade plate of "Mr Combes, Photographic Artist, Chain Pier, Brighton". Charles Combes worked from a studio on the Chain Pier Esplanade from around 1857 to 1862. * William Prudden , a 45 year old bookbinder of 14 Spring Gardens, Brighton, is recorded in the 1851 census of the town, but William Prudden the photographer does not appear to be connected to this particular namesake. William Prudden the bookbinder was born in Chichester in 1808. On 2nd November 1827, William Prudden of Chichester married Frances Mears (born c1811, Normanhurst, Sussex) in Brighton. The couple had at least two sons - William Prudden junior (born 1828, Brighton), who died young, and George Prudden (born c1832, Brighton), who became a bookbinder. Mrs Frances Prudden died in 1859 and William Prudden took a second wife, Grace. When William Prudden senior died in 1870, his widow Mrs Grace Prudden and his son, George, took over the bookbinding business. When the 1861 census was taken on the 7th April, William Prudden is recorded as a boarder at 57 Carlton Street, Brighton. On the 1861 census return, William Prudden is described as an unmarried "Photographer", aged 18. On 20th January 1867, William Prudden married Harriett Mary Davey (born 1842, Hurstpierpoint, Sussex) in his bride's home village of Hurstpierpoint. [Marriage registered in the Cuckfield District in the March Quarter of 1867]. Harriett Mary Davey was the daughter of Jane and Richard Davey **, a coachman, having been baptised at Hurstpierpoint on 23rd October 1842. At the time of his marriage, William Prudden gave his occupation as "Artist". The couple's first child, Philadelphia Jane Prudden was born on 11th November 1867, but, sadly, she died the following year. When their daughter was born, William Prudden and his wife were living at 2 West Hill Place, Brighton. A second daughter Ettie Harriett Prudden, was born in 1869 and baptised at St Nicholas Church, Brighton, on 15th August 1869. Another daughter, Agnes Kate Prudden was born at the end of the following year [ Birth registered in Brighton during the 4th Quarter of 1870]. At the time of the 1871 census, William Prudden and his family were living at 7 Montpelier Road (East), Brighton. William Prudden gives his occupation as "Photographic Artist" and his age as 29. William's place of birth is recorded as "City of London, Middlesex". Living with William Prudden at the house in Montpelier Road East was his twenty-eight year old wife, Harriett, and his two daughters - one year old Ettie and five month old baby Agnes. In 1872, William and Harriett Prudden produced a son named William Frederick Prudden, but he died shortly afterwards ( The birth and death of baby William was recorded in the Brighton Registration District during the 3rd Quarter of 1872 ). 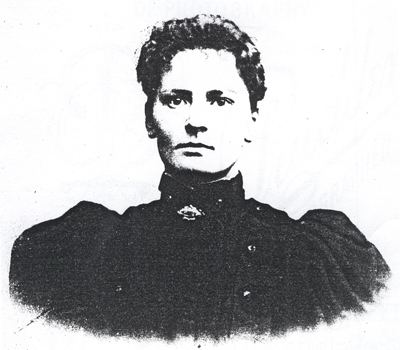 Harriett Prudden gave birth to three more children over the next five years - Augusta Emma Prudden (baptised 19th October, 1873), Laura Anna Prudden (baptised 3rd October 1875), and finally in 1877, the long awaited son, Percy William Prudden ( birth registered in Brighton during the September Quarter of 1877). 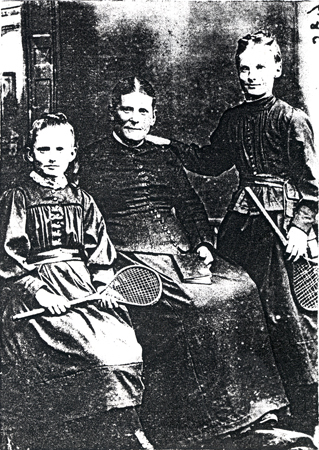 [ABOVE] A family group portrait which possibly depicts Mrs Harriett Prudden (1842-1891), William Prudden's first wife, and their two daughters Laura Prudden (born 1875) and Augusta Prudden (born 1873). ** Richard Davey was possibly related to the Richard Davey of Hurstpierpoint who served as a soldier in the Napoleonic Wars and wrote letters to his wife from Portugal and Spain during the Peninsular Campaign. This Richard Davey left Hurstpierpoint in 1794 at the age of 15 to join the army. He served in Wellington's army during the Peninsular Campaign and he wrote letters to his wife throughout this period. After leaving the army, Richard Davey served as the Parish Clerk of Hurstpierpoint. Davey's letters were published in 2002 in a book entitled Over the Hills and Far Away : A Hurstpierpoint Soldier in Wellington's Army by Peter Berresford Ellis, Richard Davey's great-great-great grandson. [ABOVE] The reverse of a carte-de-visite by William Prudden of 19 Tidy Street, Brighton (c1875). Prudden states that he had spent 16 years with the Brighton photographer Charles Combes. 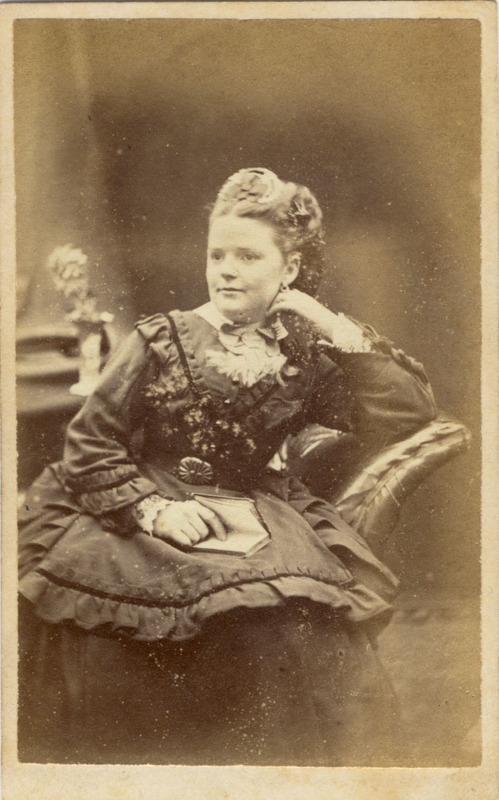 [ABOVE] Portrait of a seated woman with a book, a carte-de-visite photograph produced by William Prudden of 19 Tidy Street, Brighton (c1875). 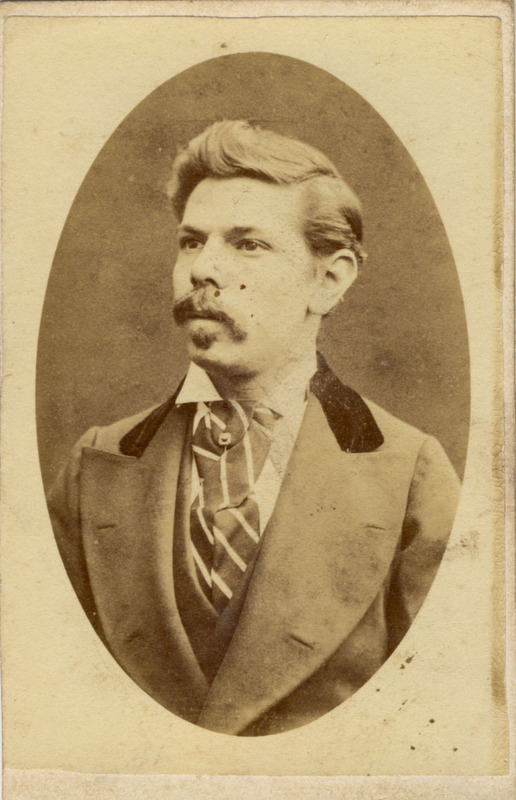 [ABOVE] Portrait of a man in an oval frame, a carte-de-visite portrait produced by William Prudden of 19 Tidy Street, Brighton (c1875). Around 1869, after 16 years of employment with Charles Combes as a general assistant, camera operator and photographer, William Prudden left Charles Combes' studio in Preston Street to set up his own photography business in Brighton. William Prudden began by working from his home at 2 West Hill Place, Brighton but he soon shifted his photographic studio to 8 West Hill Place, the former work premises of artist and miniature portrait painter, Daniel Byrne (born c1815, Dublin, Ireland). After a year or so, William Prudden moved the location of his studio to 44 Rose Hill Terrace, near Brighton's London Road. By 1873, William Prudden had established a permanent studio at 19 Tidy Street, in the North Laine district of Brighton. 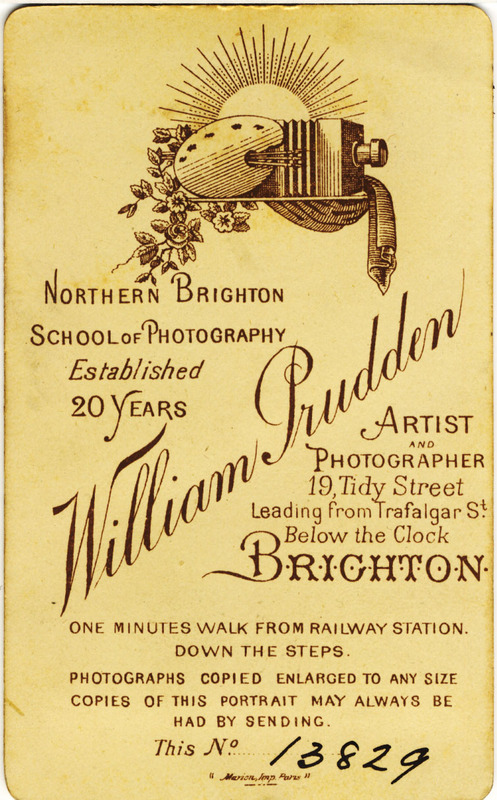 William Prudden was to run a studio at 19 Tidy Street, Brighton, for the rest of his photographic career, a period of nearly 37 years. 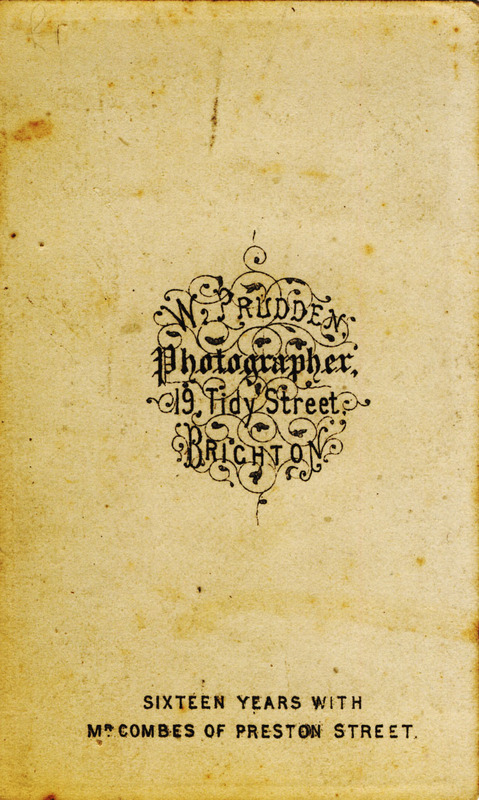 [ABOVE] An early trade plate for William Prudden, Photographer of 19 Tidy Street, Brighton (c1873). The business and personal life of Charles Combes, William Prudden's former employer, went into a serious decline after 1869, the year William left his employment. By 1871, Charles Combes seems to have sold his studio at 32 Preston Street and was operating his photography business from his home at 19 Wyndham Street, Brighton. Charles Combes' wife, Mary Ann Combes, developed a mental illness and appears to have been addicted to alcohol. Mrs Combes became violent towards her husband and on several occasions threatened to kill him. Mrs Combes had been confined to a lunatic asylum for a period of nine months and when she was kept away from "stimulating drinks" her condition appeared to improve. Mrs Combes was discharged from the mental hospital in August 1871, but within months she began to drink heavily again and started to behave strangely. Mary Ann Combes had been to the police several times to complain about her husband's bad conduct and on the evening of Sunday, 5th May 1872, she turned up at Grafton Street Police Station to allege that her husband Charles Combes was "knocking her about". The police observed that she appeared "the worse for drink" and she was asked to make a formal complaint at the Magistrate's court the following day. The police later reported that Mary Ann Combes had been "addicted to drinking" and "suffered much from mental derangement". Mrs Combes had also "been in the habit of staying out very late at night, and of frequenting low neighbourhoods and very objectionable company". On leaving the police station, Mary Ann Combes "was joined by a gentleman, not her husband, and was never after seen alive". The body of Mary Ann Combes was found on Brighton beach early on Monday morning. The dead woman had a bruise over the eye, but the attending surgeon concluded that death had been caused by drowning. The jury returned an "open verdict" and the Coroner remarked that it was "a pity that the man cannot be found who was seen in her company" before her death. After his wife's death, Charles Combes became gloomy and depressed. He believed he was going mad and "he often alluded to the loss of his wife, and seemed extremely unhappy". By November 1872, Charles Combes was no longer in business as a photographer and he gave up his house in Wyndham Street and took lodgings at the Bath Arms in Union Street, a public house kept by William Robinson, the step-father of his late wife. William Prudden was still in contact with his former employer and on Saturday, 9th November 1872, Charles Combes managed to obtain from William "a quantity of cyanide of potassium", an extremely poisonous chemical commonly used in photography ***. On the morning of Sunday 10th November 1872, the dead body of Charles Combes was discovered in his bedroom at the Bath Arms. Death was clearly caused by taking a very large quantity of potassium cyanide. Dr Taaffe, who analysed the contents of the victim's stomach, stated that Charles Combes "had taken sufficient poison to destroy a whole parish, and that his death must have been instantaneous". The Coroner's jury returned a verdict that Charles Combes had committed suicide by taking poison while "temporarily insane". 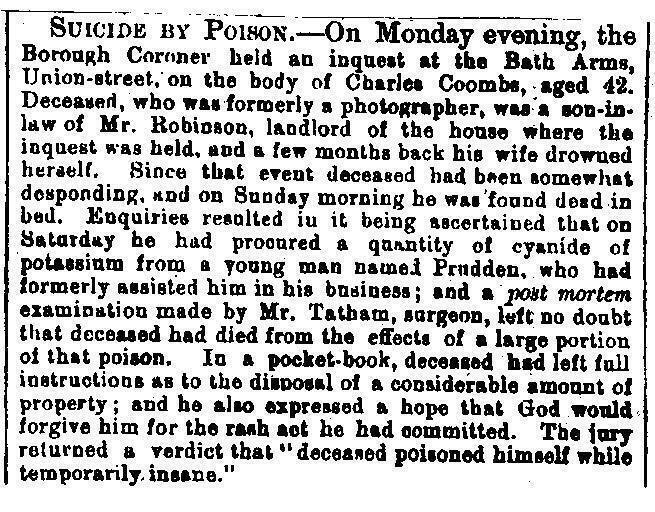 [ABOVE] A report on the suicide of Charles Combes, the Brighton photographer and former employer of William Prudden, which appeared in a local newspaper on 16th November 1872. The report notes that Charles Combes had poisoned himself with potassium cyanide, an extremely toxic chemical used in photography, and states that "he had procured a quantity of cyanide of potassium from a young man named Prudden, who had formerly assisted him in his business". No longer in business as a photographer, Charles Combes had to obtain the poisonous photographic chemical from his former assistant William Prudden, who was now running his own photographic studio in Brighton. *** It was not uncommon for desperately unhappy photographers to commit suicide by taking potassium cyanide. In June 1874, Alfred Francis, a photographer in East Grinstead, killed himself by this method of poisoning. In June 1882, it was reported that a travelling photographer, who was not doing good business at Broadwater Green, near Worthing, ended his life by swallowing some of his photography chemicals. [ABOVE] The designs on the back of four cartes-de-visite produced by William Prudden at 19 Tidy Street, Brighton from around 1878 to 1895. Carte No 1 dates from around 1878 ; Carte No 2 was produced around 1890 ; Carte No 3 dates from around 1892 ; Carte No 4 was produced around 1894. [LEFT] A Victorian map of Brighton which shows the location of William Prudden's photographic studio and home at 19 Tidy Street, Brighton [marked by a large red dot]. 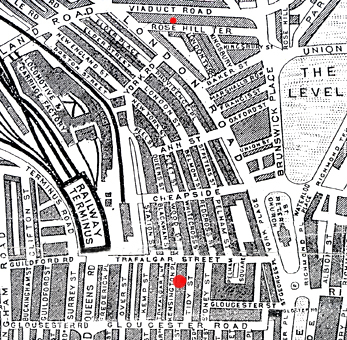 Previously, William Prudden had operated a photographic portrait studio in West Hill Place [marked by a smaller red dot to the left of the Railway Station]. William Prudden was previously employed by the photographer Charles Combes (1830-1872) who, during the 1860s, had operated studios at 19 Bedford Place and 31 & 32 Preston Street, Brighton [marked by blue dots]. In his publicity, William Prudden declared that he had worked "16 years with Mr Combes of Preston Street". [BELOW] Another Victorian map of Brighton which shows the proximity of William Prudden's photographic studio in Tidy Street [marked by a large red dot] to Brighton's Railway Station and Terminus and the nearby Railway Locomotive and Carriage Factory. Many of Prudden's customers were railway workers. Previously, William Prudden had briefly operated a photographic portrait studio at 44 Rose Hill Terrace [marked by a smaller red at the top of the map]. 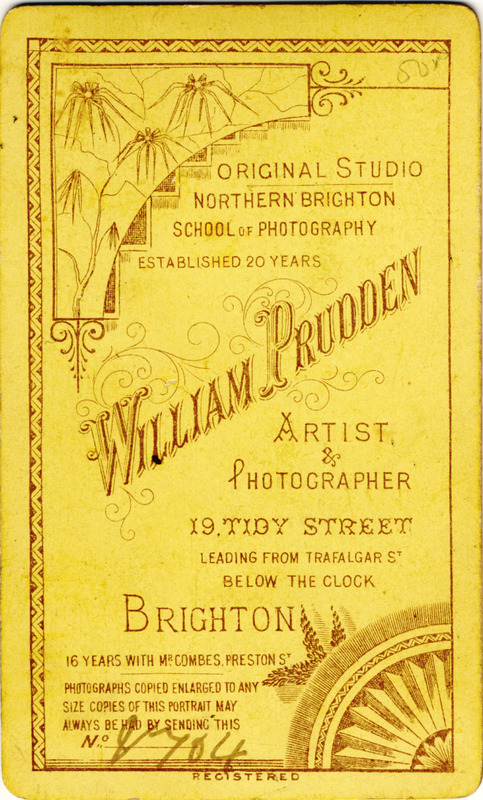 From around 1873, William Prudden lived and worked at 19 Tidy Street, Brighton. The studio at Tidy Street was not in a prime position for a photographic portrait studio. Tidy Street, itself, was a street of fifty houses which ran between Gloucester Road and Trafalgar Street. The buildings in Tidy Street were predominantly residential, with only a few shops, a small beer-house, known as The Gas-Fitters' Arms, and a public house, The Rising Sun, at number 23. The majority of the houses in Tidy Street were occupied by artisans, tradesmen, shop assistants and labourers. 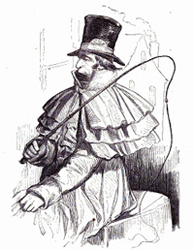 Most of the inhabitants of Tidy Street were either skilled workers, such as carpenters, cabinet makers, plumbers and bricklayers, or ordinary working people who were employed in the shops, workrooms, and small factories of Brighton. Trafalgar Street, at the northern end of Tidy Street, led to Brighton Railway Station and a number of the residents of Tidy Street were railway workers or employed at Brighton's large Railway Works. Tidy Street was not a commercial or business area. In the 1870s and 1880s there were only a few workshops and couple of shops - James Andrews' butchers at No. 27 and a general store near the junction with Kensington Place. Number 19 Tidy Street had not previously been used as a place of business and was an ordinary house when William Prudden and his family moved in around 1873. Many of the householders in Tidy Street let out rooms to boarders and lodgers. In addition to shop-workers and travelling salesmen, rooms in Tidy Street were used as lodgings by actors, actresses and entertainers. Given its location in a rather anonymous street, situated some distance from the High Street shopping areas and the bustling crowds on the seafront, it is surprising that William Prudden managed to build up a reasonably successful business at his studio in Tidy Street. When the census was taken on 3rd April 1881, William Prudden, his wife Harriet, and their five children are shown residing at 19 Tidy Street. Also living in the household is a general servant, 16 year old Agnes Stoner. In terms of domestic service this was rather modest, but very few households in Tidy Street were able to afford servants. The domestic servants that did reside in Tidy Street were outdoor servants ( for instance, there were a couple of coachmen living in the street) who were lodging at houses in the street, but were employed elsewhere in the town. In the 1881 census, William Prudden is described as a "Photographer", aged 39. William Prudden probably worked alone in the early years at Tidy Street, receiving some assistance from his wife, Harriet. On the 1891 census return, William's thirteen year old son, Percy William Prudden is entered as a "Photographer's Assistant". In the 1901 census, William Prudden is recorded as a "Photographer (Employer)". By this time Percy Prudden was married and working as a carpenter, so his father probably had to employ one or two assistants. One of Prudden' employees was Florence Mary Wade (born 1876, Hove, Sussex ), who at the time of the 1901 census was boarding with the Pannell family at 21 Tidy Street. The census enumerator records Florence Wade as a 24 year old "Photographer's Assistant". Pannell had obviously expanded his business premises at No.19 in the late 1880s. Pannell acquired a house a few doors away at No 21 Tidy Street and made this house the family residence. All of the premises at No 19 could now be used for Pannell's photography business. 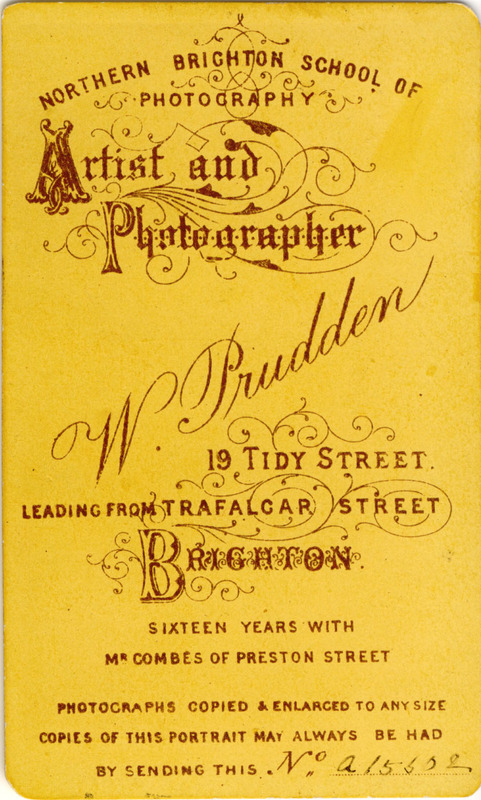 Apart from listings under the heading of "Photographers" in local trade directories, Prudden does not appear to have advertised his services very often, and I have not discovered any newspaper advertisements for Prudden's studio. Consequently, we do not have any details of his scale of charges for portrait photographs. Another photographer, Alfred Wright, who was active in Brighton in the 1890s, had a studio in Kensington Place, a street that ran parallel to Tidy Street. Alfred Wright charged a shilling for a single carte-de-visite portrait, 2s 6d for six copies and 4 shillings for a dozen. The larger cabinet size portrait would cost two shillings for the first copy, six shillings for half a dozen copies and ten shillings would buy 12 copies. The Brighton branch of the firm of A & G Taylor, which had a studio in the busy Kings Road, charged 6 shillings for a dozen cartes-de-visite in 1888. The prices of high class studios in Brighton's Kings Road, such as those of Mayall & Co and Hennah & Kent, were considerably higher. In 1892, the well known photographer, W. P. Marsh ,who had a studio on the seafront at Bognor, charged 8 shillings for a dozen cartes and 18 shillings for 12 copies of a cabinet portrait. C. H. Boswell, a photographer who ran a small studio at 9 North Street Quadrant, opposite the Clock Tower, advertised "High-Class Photographs at Popular prices". In an advertisement published in March 1899, Boswell drew the public's attention to his "extraordinary Low Prices" - 12 cartes for 3s 6d , 12 cabinets for 10 shillings. Given the obscure position of Prudden's studio, it is likely that his charges would not be high and would be closer to the prices offered by Wright and Boswell. 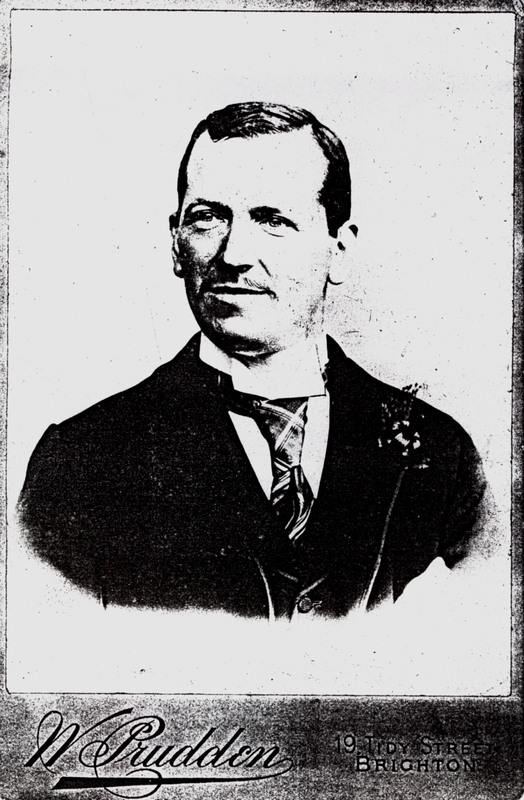 [ABOVE] A portrait believed to be that of the Brighton photographer William Prudden (1842-1922). The photograph can be dated to the period around 1897 - the year that William Prudden married Mary Penfold (born 1872, Hurstpierpoint, Sussex). 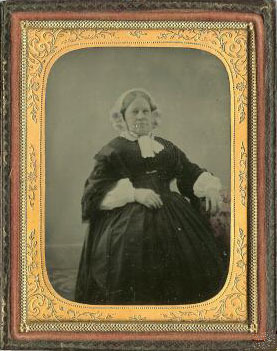 The photograph has the appearance of a wedding photograph and there is a matching photograph of a young woman who could be Mary Penfold. [ABOVE] A portrait believed to be that of Mary Penfold (1872-1909), the second wife of the Brighton photographer William Prudden. Alternatively, the portrait could depict one of Prudden's grown-up daughters. [ABOVE] The back of a carte-de-visite produced in the 1890s by William Prudden of 19 Tidy Street, Brighton. * In the 1890s, William Prudden's life went through some significant changes. Early in the year, William's wife Harriett died at the age of 48. [Death registered in the March Quarter of 1891]. A few months later, Ettie Harriet Prudden, William's eldest daughter, also died. Ettie Prudden, a dressmaker, was only twenty-one years of age at the time of her death [Death registered in the June Quarter of 1891]. When the 1891 census was carried out, William Prudden is shown living at 21 Tidy Street (a few doors away from his studio) with his two youngest children - fifteen year old Laura Prudden, who gives her occupation as "dressmaker", and thirteen year old Percy Prudden, who was employed as a photographer's assistant in his father's studio. William Prudden is recorded as a 49 year old widower and his profession is given as "Photographer" (In the column for place of birth, the enumerator has written "Not Known"). William Prudden's two other daughters had left the family home, but were boarding at a nearby house. 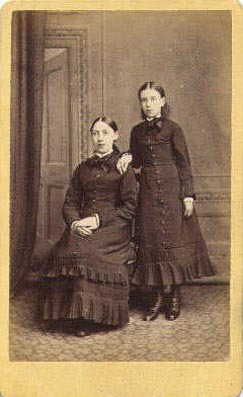 Agnes Prudden, aged 20, and her younger sister, eighteen year old Augusta Prudden, were boarders at the house of Richard and Ann Lee at 39 Tidy Street. Both sisters give their profession as "Artist (employed)". It is likely that the two sisters worked as artists for their father, retouching and colouring his photographic portraits. During the next three years, all three of William Prudden's daughters were married. The first to marry was the youngest, Laura Anna Prudden, who was only seventeen when, in 1893, she married Sidney Herbert Webb (born 1870, Brighton), who later gave his occupation as "Butterman". [Marriage registered June Quarter 1893]. Agnes Kate Prudden, the artist daughter, married Alfred Jolliffe, a plumber, in 1894. [Marriage registered September Quarter 1894]. Augusta Emma Prudden married Frederick Rider, a twenty-two year old clerk, in 1894 [Marriage registered December Quarter 1894] and moved away with her husband to Islington, North London. William Prudden married for the second time on 1st December 1897. William's new bride was twenty-five year old Mary Penfold (born 1872, Hurstpierpoint, Sussex), a young woman who had been Prudden's domestic servant in the 1890s and was a relative of his late first wife. William Prudden started a second family with his young wife. Mary Prudden gave birth to Archibald William Prudden on 11th January 1898 at their home in Tidy Street. The following year, a second son, Gilbert Charles Prudden was born on 23rd May 1899 [ Birth registered during the September Quarter of 1899). At the time of the 1901 census, William Prudden, his wife Mary, and their two young boys were residing at 21 Tidy Street, near his photographic studio. William Prudden is described as a "Photographer (Employer)", aged 59. Interestingly, on this census return, William Prudden's place of birth is given as Barnet, Hertfordshire. In the September Quarter of 1900, Percy William Prudden, the only surviving son from his first marriage, wed Catherine Harriett Knight (born c1871, Brighton). At the time of the 1901 census, Percy Prudden was living in Preston, on the outskirts of Brighton. He had apparently abandoned photography as a career as he gives his occupation as "Carpenter" in the census return. In the 19th century, Tidy Street was primarily a residential street, with only a few shops and a couple of beer-houses. The majority of the houses in Tidy Street were occupied by artisans, tradesmen, shop assistants and labourers. A number of the residents of Tidy Street were railway workers or employed at the Railway Station or Brighton's large Railway Works. Number 19 Tidy Street had not previously been used as a place of business and was an ordinary dwelling house when William Prudden and his family moved in around 1873. Victorian photographic studios were generally located at the top of buildings to take advantage of the available light. Given the unsuitability of this small two storey building for photographic activities, William Prudden would have had to construct a kind of glass-house studio at the back of his house, specifically designed for the taking of photographic portraits. 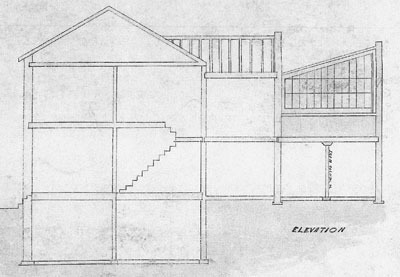 Terry Prudden has recently forwarded architect's drawings dating from 1873 which shows how a "glass studio" was added at the rear of the original structure of the house. "I have just come across the Sussex PhotoHistory website and your section on William Prudden who lived and worked at 19 Tidy Street. Absolutely fascinating information, particularly as I am in the fortunate position to be the current owner of the house. When the sun is quite low, you can still, rather mysteriously, make out the words " W. Prudden" painted on the front of the house. It is very faint but evident, despite the many number of coats of paint that must have been applied over the years." Painting the front of a house with the photographer's publicity was not an unusual practice. There is a photograph from the 1870s showing the advertising painted on the exterior walls of Henry Spink's house and studio at 34 Goldstone Villas, Cliftonville (now Hove), West Brighton. [ABOVE] No. 19 Tidy Street, Brighton photographed in 2008. It was at this house in Tidy Street that the Brighton photographer William Prudden was based between 1873 and 1909. 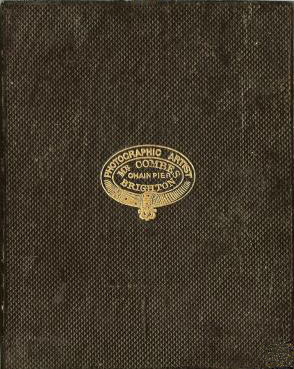 [ABOVE] Plans for the Photographic Studio at No. 19 Tidy Street, Brighton. (Dated 15th April 1873). 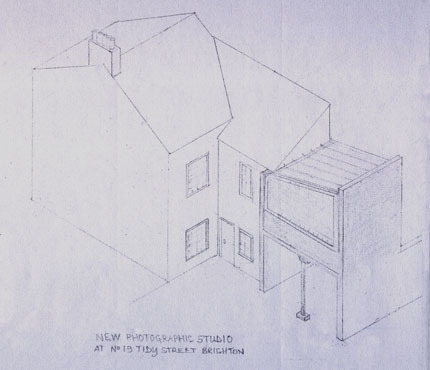 A "glass-house" style studio built as an extension to William Prudden's house at No.19 Tidy Street, Brighton. [RIGHT] Isometric projection drawing based on the above plans. Around 1900, William Prudden added an Electric Light Studio to his regular Daylight Studio. He carried on working as a photographer at 19 Tidy Street until about 1909. 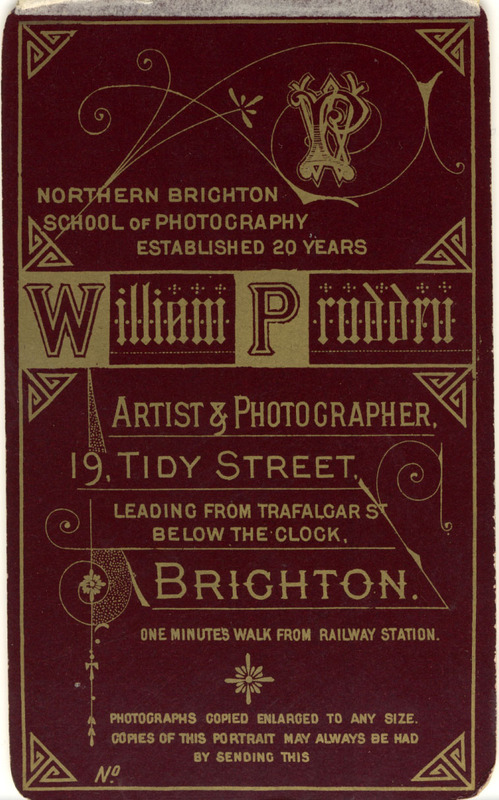 William Prudden is listed as a photographer at 19 Tidy Street, Brighton, in Kelly's 1909 Sussex Directory and W. T. Pike's Brighton & Hove Directory and Local Blue Book, published in 1909. Between 1901 and 1909, William Prudden fathered four more children - Reginald Penfold Prudden (born 18th May 1901), Florence Mary Prudden (born 1903), Lilian Kate Prudden (born 1905), and finally, Edith Alice Prudden in 1909. On 15th May 1909, Mrs Mary Prudden, William Prudden's second wife, died at the age of thirty-eight. Mary Prudden had contracted pulmonary tuberculosis and, weakened by the disease and the recent birth of a child, she suffered a fatal heart attack. The sudden death of his wife placed a strain on William Prudden's ability to run a business and care for his young family. William Prudden was approaching his 70th birthday and it is perhaps understandable that he had to give up his photography business in Tidy Street around the time of his wife's death. In 1910, William Prudden's youngest child Alice died before reaching her first birthday. William Prudden and his young children were forced into the care of Brighton's Workhouse. William's five children eventually entered the Warren Farm Industrial School and Orphanage at Rottingdean. 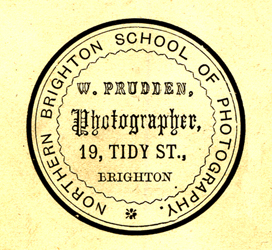 William Prudden is last recorded as a professional photographer at 19 Tidy Street, Brighton, in local trade directories published in 1909. Prudden's name does not appear under "Photographers" in the 1910 edition of Pike's Directory or in Kelly's Directory of 1911. Between 1912 and 1913, the firm of Gander & Sawyer operated the studio at 19 Tidy Street, but there is no evidence of a photographic studio at the Tidy Street address after 1913. When the census was carried out on 2nd April 1911, William Prudden was out of the workhouse and was living at 59 Havelock Road, Brighton, in the Preston district of Brighton. On the 1911 census return, William Prudden, a 69 year old widower, gave his occupation as "Photographer", so presumably he was still using his camera to earn his living. In 1911, as was the case in 1901, William Prudden once again gave his place of birth as "Barnet". [ At the time of the 1911 census, William's son, thirty-three year old Percy William Prudden was employed as a "Telephone Fitter" and was living with his wife Catherine and their two children (Ethel, aged 9, and Herbert, aged 7) at 56 Chester Terrace, Brighton]. In the early 1920s, William Prudden's health went into decline and he was eventually transferred to the Steyning Union Workhouse & Infirmary on Upper Shoreham Road, Kingston-By-Sea, near Shoreham (now Southlands Hospital), where he died of a cerebral haemorrhage on 5th November, 1922. William Prudden's reported age at death was recorded as 80 years, which would support a birth year of 1842. 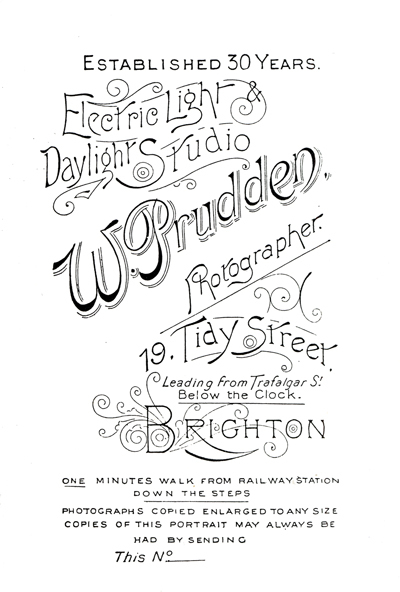 [ABOVE] The reverse of a cabinet card produced by William Prudden of 19 Tidy Street, Brighton giving details of his "Electric Light & Daylight Studio" (c1900). Thanks to Terry Prudden of Dumbleton, Evesham for providing additional information on William Prudden's Family History. Terry Prudden is William Prudden's great grandson. I am grateful to both Yvonne Dedman and John Yates who have carried out research which has established that the Brighton photographer William Prudden was the son of Philadelphia Prudden (c1808-1861). William Prudden is the maternal grandfather of John Yates. Although not descended from the Brighton photographer, Yvonne Dedman has gathered family history information about William Prudden during her research into the Pruden (Prudden) Family of London and Hammersmith.